The first day at the WACA was not very much different from that of the Adelaide . 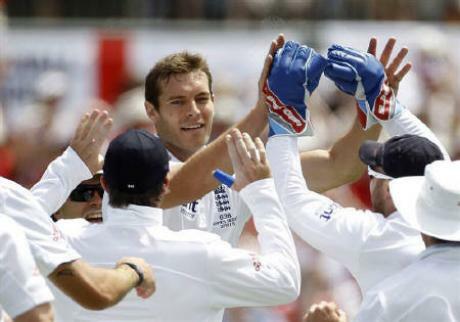 The English bowlers fully dominated the day with Anderson and the re-called Tremlett bagging three wickets each,while Finn took two.The Aussies finally bundled out at 268.Tremlett returned to Test scene since last playing in 2007, being preffered over Bresnan in order to replace Broad.He was able to get wicket in this first over removing Hughes , who was being troubled a lot on his recall. England currently are at 29-0 at stumps with captain Strauss and Cook on the crease. Fast bowlers made early impact at the start of the day removing Watson, Hughes, Ponting, and Clarke. At 4-36 Australia was in very fragile position until their in-form Hussey took the charge,who after removal of Smith made a first substantive partnership with Haddin.Hussey finally on 61 was removed by Swann while Australia were still in a deep trouble at 137-6.Michael Hussey has scored over fifty in all his four innings in the series. He has 401 runs at an average of 100.25 so far.Next to be coming in was Mitchell Johnsonn, who had been recalled for the this test made some valuable contribution with Haddin making a 52 runs partnership and fianlly Haddin fell at 53.For Johnson it was a crucial innings, redeeming himself after Brisbane bad show. He looked better shape as compared to top order compatriots and played with confidence and flow. Siddle and Hilfenhaus took up the attacking mindset, unleashing a barrage of shots during a final-wicket stand of 35 which shook England a little, until Swann returned to have Hilfenhaus taken at short leg. The final total was better than it may have been earlier in the day, but it's slim pickings for Australia at the moment. Ponting at this time of his cricket does not look in his full spark. His influence on the side is disappearing and his power over the selectors has waned. His batting form also lost momentum in a great way. Ricky Ponting averages just over 41 in matches played in the last two years. In 73 matches between 2002 and 2008, he averaged over 65 with 27 centuries.Though still in perfect physcial condition but inner he is losing his mind, and control over his captaincy. Let us hope he gathers himself and proves to himself and his team.